A draftsman rendering the Decker Building, 33 Union Square West. I passed through Union Square soon after noon today. This busy cross section of thoroughfares brings together Broadway, Park Avenue South and East 14th Street. It draws students from nearby New York University and New School University, workers from surrounding office buildings and artists selling their wares. It is also home to the biggest and best Farmers Market in the City four days out of the week, Monday, Wednesday, Friday and Saturday. Detail, the Decker Building, 33 Union Square West. Today, the northern end of Union Square was hosting the History Channel’s NYC edition of Cross-County Cookout, featuring the Ultimate Smoker & Grill, slow-smoking 2,000 pounds of meat beneath its 20-foot hydraulic lid. As popular as this cookout was because I am a vegetarian, it held no attraction for me. Instead I chose to focus on an artist at work. Using India ink on paper a draftsman was meticulously rendering the elaborate façade of the Decker Building. Fascinating! He had spread out his materials on the pavement, out of the line of foot traffic, directly opposite the Decker Building. I made the mistake of asking him how long he had been working. He did not respond. Never disturb an artist at work! The Decker Building, sometimes called the Union Building, at 33 Union Square West, stands between West 16th Street and West 17th Street. It is only 11 stories tall; its narrow 30-foot sliver width gives it a much taller appearance. The architect John H. Edelmann (1852–1900) mixed Venetian and Islamic motifs in his 1892 design for the Decker Brothers Piano Company, established in 1856. The company had had a four-story building on the same lot that was built in 1869. Union Square was quite the fashionable post-Civil War retail address, especially after Tiffany & Co. had relocated to its own building at West 15th Street and Union Square West in 1856. 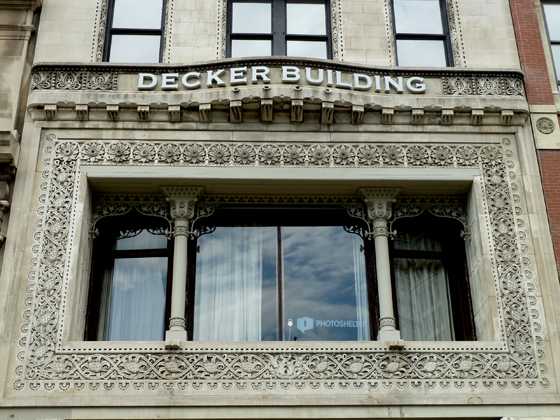 The Decker Building’s abundant decoration is fashioned from terra cotta. See the Decker Building and all the Union Square attractions when you are part of the Five Squares and a Circle Tour. The Decker Building, center, 33 Union Square West. The Decker Building, 33 Union Square West. From 1968 through 1973, Andy Warhol operated his Factory (the second of three such facilities) out of the sixth floor loft of the Decker Building. This is where Warhol mass produced his silkscreens and filmed his movies from 1968 to 1973. It was in this building too where Valerie Solanas shot Warhol and art critic and curator Mario Amaya in 1968. Miss Solanas spent three years in the Women’s House of Detention for her crime; the jail’s former location is part of the Greenwich Village Walking Tour. In 1995 the Decker Building was completely remodeled into rental apartments.